remderosier has 133 positive feedback, 0 neutral feedback and 0 negative feedback, for an overall percentage of 100% positive feedback. Positive feedback from folipurba21 on Wed, 26 Jul 2017 13:24:48 -0500: I bought from remderosier. Positive feedback from quailien on Sat, 17 Jun 2017 12:16:08 -0500: I sold to remderosier. I sold a Herdier die to remderosier. Remderosier paid promptly and was good at communicating with me. Thank you so much for your business! Enjoy your new die! Positive feedback from nysaurus on Fri, 9 Jun 2017 14:47:27 -0500: I traded with remderosier. Positive feedback from azazelmewtwo on Tue, 9 May 2017 14:54:40 -0500: I bought from remderosier. Positive feedback from tayran on Mon, 8 May 2017 17:02:48 -0500 for this transaction: I bought from remderosier. Bought a sleeping Rockruff figure. Arrived securely packaged, was easy to open, and now he snoozes happily below my computer monitor. Lovely seller. Would buy again! Positive feedback from linameerun on Mon, 3 Apr 2017 05:34:09 -0500: I bought from remderosier. Positive feedback from hebilea on Sun, 19 Mar 2017 15:07:08 -0500: I sold to remderosier. Positive feedback from maundering on Fri, 24 Feb 2017 22:11:42 -0600 for this transaction: I bought from remderosier. Positive feedback from ku_bek on Thu, 1 Dec 2016 04:44:42 -0600: I bought from remderosier. I won Raikou and Suicune EU figures from their auctions, they arrived fast and well protected, thank you! Positive feedback from crystariium on Sat, 26 Nov 2016 20:57:08 -0600: I bought from remderosier. Positive feedback from usagimakeup on Tue, 22 Nov 2016 17:19:18 -0600: I bought from remderosier. Positive feedback from linameerun on Sat, 12 Nov 2016 04:04:49 -0600: I bought from remderosier. Positive feedback from mightyena_mad_7 on Sun, 6 Nov 2016 13:14:17 -0600: I bought from remderosier. I won two Poochyena bootie figures from Remderosier in their auctions. Communication was great, payment went smoothly. Little mix up with a number on the tracking number. They replied with the correct number and the package arrived the next day! Love my Poochy booty. Thanks! Positive feedback from growly on Thu, 9 Jul 2015 12:51:09 -0500: I bought from remderosier. Bought a mini model from them. Shipping was definitely on the slower side but I was kept in the loop, so I wasn't really worried. Thanks, glad to have this! Positive feedback from wobbuwhit on Thu, 2 Jul 2015 17:32:24 -0500: I bought from remderosier. I won two Houndoom figures in an auction from this seller! Seller was kind, prompt, and kept me very updated. Everything went perfectly and my doggies arrived safely. Thanks so much! Positive feedback from vulpeslagopus on Fri, 5 Jun 2015 12:02:00 -0500: I bought from remderosier. Bought some Absol stickers from their sticker sales post a while back- Fast shipping, and a great seller- Thanks! Positive feedback from raymence on Wed, 28 Jan 2015 14:17:04 -0600: I bought from remderosier. Positive feedback from stalkingsuicune on Sat, 24 Jan 2015 14:18:09 -0600: I bought from remderosier. Positive feedback from shinamishi on Fri, 23 Jan 2015 23:32:44 -0600 for this transaction: I bought from remderosier. I bought some stickers from their sales; very quick and friendly response, came in a reasonable time, and they were well protected in their mail envelope. Great seller! Thanks for the stickers! Positive feedback from synysterxskittl on Fri, 23 Jan 2015 14:51:52 -0600: I bought from remderosier. Positive feedback from hebilea on Wed, 21 Jan 2015 14:49:00 -0600: I sold to remderosier. Positive feedback from 0fabliau on Wed, 10 Dec 2014 12:12:57 -0600: I bought from remderosier. I bought Greninja, Chesnaught, Litwick, and Chandelure stickers! I went to add to my order and they forgot to tell me It shipped, which was okay! They offered free shipping for the items I added to my order which was beyond generous! Very good seller who professionally handles mix ups! Positive feedback from reichykins on Fri, 28 Nov 2014 21:03:59 -0600: I bought from remderosier. I bought a Flaaffy sticker from, was very nice and shipped quick! Thank you! Positive feedback from vulpeslagopus on Tue, 25 Nov 2014 21:09:54 -0600: I bought from remderosier. Bought numerous stickers and flats from. Secure and quick shipping! Positive feedback from partywooper on Tue, 11 Nov 2014 20:04:03 -0600: I bought from remderosier. Positive feedback from ladysheik on Sun, 17 Aug 2014 06:37:16 -0500: I bought from remderosier. I purchased a Mega Absol Retsuden stamper. :) Arrived safely and quickly, thank you very much! Positive feedback from hebilea on Mon, 21 Jul 2014 05:17:26 -0500: I sold to remderosier. Positive feedback from lone_enigma on Mon, 14 Jul 2014 12:34:46 -0500: I bought from remderosier. I purchased 4 XY items; one Fennekin suction cup and three retsuden stampers (Meowstic, Yveltal and Fennekin). Items arrived safe! Thank you much! Positive feedback from chromapika on Tue, 24 Jun 2014 15:00:16 -0500: I sold to remderosier. Positive feedback from hebilea on Mon, 23 Jun 2014 13:44:56 -0500: I sold to remderosier. Positive feedback from azureyoshi on Sat, 21 Jun 2014 11:23:23 -0500: I bought from remderosier. Positive feedback from superkpopholic on Fri, 20 Jun 2014 17:13:58 -0500: I bought from remderosier. I bought some Trozei stickers from this seller. Communication was wonderful and the transaction went great! Thanks a bunch! Positive feedback from felixkeep on Wed, 18 Jun 2014 00:04:45 -0500 for this transaction: I sold to remderosier. Positive feedback from b4ckbone on Sat, 14 Jun 2014 19:40:43 -0500: I traded with remderosier. Positive feedback from lone_enigma on Wed, 11 Jun 2014 14:02:32 -0500: I bought from remderosier. I made a purchase for quite a few Pokemon Trozei stickers. Friendly seller and quick to respond! Stickers were packed with care and arrived safely! Positive feedback from fokko on Fri, 6 Jun 2014 16:27:41 -0500 for this transaction: I bought from remderosier. Positive feedback from jen81489 on Wed, 4 Jun 2014 13:21:37 -0500 for this transaction: I participated in a GA with remderosier. Positive feedback from pkmnexcavation on Thu, 8 May 2014 02:20:11 -0500: I traded with remderosier. Positive feedback from rahenna on Wed, 7 May 2014 16:35:31 -0500: I sold to remderosier. Positive feedback from tdotakichan on Mon, 5 May 2014 18:16:54 -0500: I bought from remderosier. Positive feedback from btamamura on Mon, 28 Apr 2014 14:56:13 -0500: I bought from remderosier. Got three Friends plush from their auction. They were shipped out as soon as was possible and arrived safely and as shown in photos. Happy to buy from them again in the future. Positive feedback from kayeechu1993 on Wed, 23 Apr 2014 19:20:14 -0500 for this transaction: I sold to remderosier. Sold Tyrunt and Tyrantrum XY battle cards. Good communication and quick payment. Thanks! Positive feedback from okgod on Tue, 22 Apr 2014 15:59:22 -0500 for this transaction: I bought from remderosier. Bought a totodile friends plush, came in great condition and quick! Positive feedback from tofughost on Tue, 22 Apr 2014 11:14:00 -0500: I bought from remderosier. snubbull friends plush. came very fast thank you! Positive feedback from technicolorcage on Mon, 6 May 2013 16:44:12 -0500: I sold to remderosier. Won a Linoone TFG figure from my auction/sales. Great communication, very friendly, and fast payment. Welcome back anytime! Positive feedback from helloskitty on Tue, 2 Apr 2013 00:00:15 -0500: I sold to remderosier. Friendly, good communication, and quick in sending payment. A pleasure to work with, thanks! Positive feedback from yukinokami on Sun, 24 Mar 2013 23:31:20 -0500 for this transaction: I bought from remderosier. I bought some stickers! Perfect seller and items! Thanks! Positive feedback from eevie_chu on Wed, 20 Mar 2013 14:37:23 -0500 for this transaction: I bought from remderosier. Bought a lot of plush, arrived quickly and safely. Excellent seller, thank you very much! Positive feedback from tm13icebeam on Tue, 19 Mar 2013 14:02:09 -0500: I bought from remderosier. Bought a Kawaii Eevee. Item came exactly as listed, with added tag protection in package, also great communication with answering all of my queries Thanks again :3. Positive feedback from sweepshire on Tue, 19 Mar 2013 11:51:23 -0500: I bought from remderosier. I won a lucario pokedoll. They were great to work with and everything arrived quickly and safely! Positive feedback from toedychan on Fri, 18 Jan 2013 01:46:52 -0600: I bought from remderosier. Bought a flat that arrived great. :D Friendly seller. Thank you! Positive feedback from aburamechan on Thu, 10 Jan 2013 17:54:23 -0600: I sold to remderosier. Positive feedback from zora_star on Wed, 9 Jan 2013 18:16:06 -0600: I sold to remderosier. Positive feedback from mrsmuffet on Sun, 6 Jan 2013 22:54:17 -0600: I bought from remderosier. Positive feedback from hebitheivan on Sun, 16 Dec 2012 11:12:31 -0600: I sold to remderosier. Positive feedback from captainangel on Wed, 12 Dec 2012 13:30:11 -0600: I sold to remderosier. Bought lots of flats off me. Very quick to respond, easy to deal with, many thanks! :D Enjoy your item!! Positive feedback from nagaineko on Mon, 10 Dec 2012 15:42:33 -0600: I traded with remderosier. Positive feedback from wrens on Wed, 5 Dec 2012 21:17:55 -0600 for this transaction: I bought from remderosier. I bought a Swellow gachapon figure and a Swellow pencil topper! Seller was courteous and friendly, and items arrived in perfect condition. Thanks very much! Positive feedback from areteemiss on Wed, 28 Nov 2012 13:53:49 -0600: I bought from remderosier. Positive feedback from miniokami on Tue, 27 Nov 2012 18:49:39 -0600: I bought from remderosier. Positive feedback from swampeh on Tue, 27 Nov 2012 09:08:09 -0600: I bought from remderosier. I won a Jolteon kid figure in one of remderosiers auctions. They were very friendly, informative and dispatched the figure promptly. He arrived today with no problem in described condition. Highly recommended! Positive feedback from pikachuplushie on Tue, 27 Nov 2012 00:04:32 -0600 for this transaction: I bought from remderosier. Positive feedback from lulupin on Mon, 26 Nov 2012 06:59:32 -0600: I bought from remderosier. Positive feedback from myblackenedlips on Sat, 24 Nov 2012 20:30:31 -0600: I bought from remderosier. Positive feedback from schenzi on Mon, 19 Nov 2012 10:23:03 -0600: I sold to remderosier. Paid promptly and was a pleasure to work with :) Welcome back anytime! Positive feedback from hebitheivan on Sun, 18 Nov 2012 05:06:17 -0600: I participated in a GA with remderosier. Positive feedback from vinnvonn on Sat, 17 Nov 2012 13:15:48 -0600: I bought from remderosier. Positive feedback from growly on Fri, 2 Nov 2012 18:56:04 -0500: I sold to remderosier. Fast payment, thanks for your business! Positive feedback from night_requiem on Tue, 30 Oct 2012 02:43:11 -0500: I bought from remderosier. Replied to my wants list with a silver staravia chou :D Very happy! All the pieces arrived and looks great next to my normal staravia! Positive feedback from xxlatiosxx on Mon, 29 Oct 2012 07:53:25 -0500: I bought from remderosier. Positive feedback from flammablelizard on Sat, 27 Oct 2012 07:38:06 -0500: I sold to remderosier. This user commissioned a Zigzagoon from me and was an excellent and friendly buyer! They sent payment quickly and had great communication. Thanks a bunch! Positive feedback from smonda on Wed, 24 Oct 2012 21:55:12 -0500: I bought from remderosier. Positive feedback from pegasus2010 on Mon, 22 Oct 2012 12:48:18 -0500: I sold to remderosier. Comment: Prompt payment and excellent communication. Great buyer! Positive feedback from eeveelutiongirl on Sun, 21 Oct 2012 14:02:16 -0500: I bought from remderosier. Bought: Second group of perler bead sprites. The sprites arrived quickly and look great, thanks for making so many for me. Positive feedback from 3kame on Fri, 19 Oct 2012 17:04:52 -0500: I bought from remderosier. I commissioned a Torkoal Perler bead project from her, I had really liked the Nidoking she made me previously. Even though this one had some time constraints and went over 45 days, I am really pleased with my Torkoal - he looks super awesome! Thanks! Positive feedback from mitchichen on Thu, 18 Oct 2012 15:07:42 -0500: I sold to remderosier. Sold some Lillipup line stickers. Remderosier paid right away and was very polite. Would love to do business with you again! Positive feedback from jujufox on Fri, 24 Aug 2012 12:26:12 -0500: I sold to remderosier. They bought a few things from my sales post. Payment was made quickly with no problems. Thanks! Positive feedback from sakenichi on Tue, 12 Jun 2012 02:59:05 -0500 for this transaction: I bought from remderosier. Arrived quickly and safely. Great! Positive feedback from hebitheivan on Mon, 4 Jun 2012 05:14:34 -0500: I participated in a GA with remderosier. Positive feedback from wobbuwhit on Sun, 3 Jun 2012 17:46:47 -0500 for this transaction: I bought from remderosier. I won a Jakks Wobbuffet figure and mini Wobbuffet figure in one of remderosier's auctions and could not be happier! Seller was quick to get back to me and shipping was prompt. Thank you so much! Positive feedback from trynyti on Sun, 3 Jun 2012 17:21:15 -0500: I participated in a GA with remderosier. Positive feedback from pattsun on Sun, 3 Jun 2012 11:55:57 -0500: I sold to remderosier. Commissioned three cookies from me - and honestly they were a lot of fun to make ^^ Sweet buyer and always welcome back to my commissions. Thank you so much for commissioning me again! Positive feedback from flammablelizard on Sat, 2 Jun 2012 15:42:16 -0500: I bought from remderosier. I won a Charizard die from this user's auctions, and it came when I expected it to and in perfect condition! Positive feedback from cornzu on Fri, 1 Jun 2012 17:45:33 -0500: I bought from remderosier. Positive feedback from schenzi on Mon, 28 May 2012 01:35:37 -0500: I participated in a GA with remderosier. Positive feedback from eeveelutiongirl on Fri, 25 May 2012 01:31:52 -0500: I bought from remderosier. Bought: First group of perler bead sprites. The sprites were very well made, and the seller kept very good communication. Positive feedback from densuine on Sun, 20 May 2012 22:46:44 -0500: I sold to remderosier. Positive feedback from poke_zula on Sat, 19 May 2012 18:21:03 -0500: I sold to remderosier. buyer paid instantly and is welcome back anytime! Positive feedback from ivysaurr on Sat, 19 May 2012 15:01:50 -0500: I bought from remderosier. I bought a Munna hang plush. Rem was very accommodating for holding it for me and kept up good communication! Positive feedback from sorjei on Thu, 3 May 2012 18:37:22 -0500: I sold to remderosier. Positive feedback from shiningmew on Thu, 3 May 2012 14:48:52 -0500: I sold to remderosier. As usual, always a pleasure to work with! Thank you! Positive feedback from hebitheivan on Thu, 26 Apr 2012 02:33:25 -0500: I participated in a GA with remderosier. Positive feedback from hebitheivan on Wed, 11 Apr 2012 08:25:25 -0500: I bought from remderosier. Positive feedback from skittyfan on Mon, 26 Mar 2012 00:50:49 -0500: I sold to remderosier. Positive feedback from shiningmew on Sat, 24 Mar 2012 15:04:35 -0500: I sold to remderosier. Positive feedback from fizzycat on Sat, 24 Mar 2012 13:16:21 -0500: I sold to remderosier. Positive feedback from skittyfan on Thu, 22 Mar 2012 11:12:17 -0500: I sold to remderosier. Positive feedback from firevie on Sat, 17 Mar 2012 21:20:49 -0500: I participated in a GA with remderosier. Hosts organised the GA excellently, everything was very clear. Thank you for a great GA! Positive feedback from killmeneko on Tue, 13 Mar 2012 06:25:37 -0500: I sold to remderosier. Poocyena, Legendary Beast charms. Fast payment and great communication. Thanks! Positive feedback from shirohikarikaze on Sat, 10 Mar 2012 20:46:32 -0600: I bought from remderosier. Positive feedback from seyera on Thu, 8 Mar 2012 03:11:38 -0600: I participated in a GA with remderosier. I took part in the vaporeon_07 FCS GA that remderosier organised with aburamechan. The whole GA ran really smoothly, and my figures got to me very fast and packed super well. Thank you for a great GA! Positive feedback from inkyfish on Wed, 7 Mar 2012 17:00:12 -0600: I participated in a GA with remderosier. Excellently handled GA, excellent communication and would love to do business with this person again. Thanks so much for your hard work - it was appreciated! Positive feedback from umbreongirl on Mon, 5 Mar 2012 14:29:46 -0600: I participated in a GA with remderosier. Awesome GA! Very happy with my items, the communication, and the hosts. Thank you! Positive feedback from akeyma on Mon, 5 Mar 2012 08:50:35 -0600: I sold to remderosier. Positive feedback from polkadotie on Sun, 4 Mar 2012 01:25:32 -0600: I sold to remderosier. Was super patient with me being a first time seller, great communication and wonderful buyer!! welcome back anytime! Positive feedback from shiningmew on Sat, 3 Mar 2012 21:47:49 -0600: I sold to remderosier. What else can I say? remderosier is just the perfect buyer! Positive feedback from shirohikarikaze on Sat, 3 Mar 2012 16:33:41 -0600: I participated in a GA with remderosier. Positive feedback from densuine on Fri, 2 Mar 2012 21:16:49 -0600: I participated in a GA with remderosier. Positive feedback from miss10 on Fri, 2 Mar 2012 15:06:50 -0600: I participated in a GA with remderosier. I participated in a GA that she and aburamechan organized. I got my Farfetch'd items today and I love them! Thanks for organizing the GA! Positive feedback from poliwhirl on Mon, 27 Feb 2012 00:41:17 -0600: I sold to remderosier. Positive feedback from shiningmew on Wed, 22 Feb 2012 21:19:06 -0600: I sold to remderosier. Positive feedback from skittyfan on Sat, 18 Feb 2012 14:09:32 -0600: I bought from remderosier. Positive feedback from kyogres on Wed, 15 Feb 2012 21:08:30 -0600: I sold to remderosier. Bought Poochyena kid. Paid immediately and let me know when the item arrived. Positive feedback from shiningmew on Mon, 13 Feb 2012 21:08:56 -0600: I sold to remderosier. Positive feedback from hebitheivan on Sat, 11 Feb 2012 12:05:47 -0600: I participated in a GA with remderosier. Positive feedback from herar on Fri, 10 Feb 2012 20:48:26 -0600: I participated in a GA with remderosier. Positive feedback from 3kame on Mon, 6 Feb 2012 20:04:45 -0600 for this transaction: I bought from remderosier. Hells yeah! Got me an awesome custom Perler (sp?) 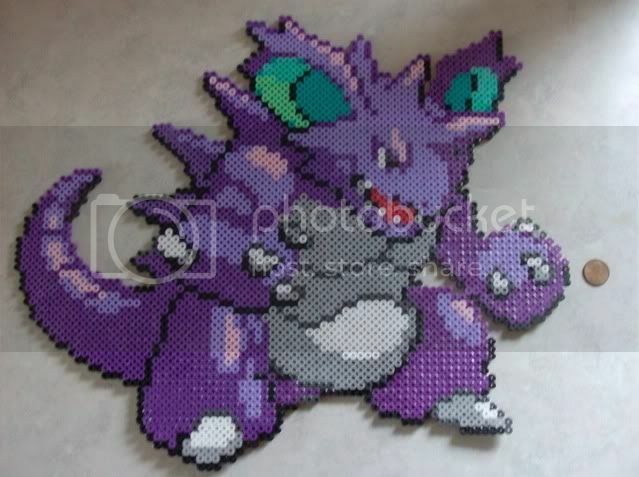 bead Nidoking!! They were super kind and were not daunted by the # of purple beads needed to make the beast! He's all done and he is awesome! Thanks! Positive feedback from nameless5555 on Mon, 6 Feb 2012 15:03:39 -0600: I sold to remderosier. This user bought a bunch of dvds & misc. lot of toys and paid very quickly! Thank you very much! Positive feedback from snowflaika on Sat, 4 Feb 2012 16:50:26 -0600: I sold to remderosier. Fast transaction, great communication, wonderful buyer ^^ thanks! Positive feedback from graywrabbit on Sat, 4 Feb 2012 16:24:27 -0600: I bought from remderosier. Positive feedback from dezchu on Mon, 30 Jan 2012 19:37:07 -0600: I sold to remderosier. Great buyer with prompt payment,Welcome back anytime :). Positive feedback from fizzycat on Sat, 28 Jan 2012 15:05:27 -0600: I bought from remderosier. Positive feedback from herar on Fri, 27 Jan 2012 16:48:45 -0600: I participated in a GA with remderosier. Positive feedback from polkadotie on Wed, 25 Jan 2012 18:46:12 -0600: I bought from remderosier. Positive feedback from shiningmew on Thu, 19 Jan 2012 14:42:42 -0600: I sold to remderosier. Another perfect transaction! Fast payment and always friendly :) Thank you! Positive feedback from godudette on Wed, 18 Jan 2012 08:53:18 -0600: I participated in a GA with remderosier. Very prompt payment and super friendly to work with! :D Welcome back to my sales at any time. Positive feedback from cheeseyspoot on Fri, 13 Jan 2012 00:03:18 -0600: I sold to remderosier. Positive feedback from jadekitty777 on Tue, 10 Jan 2012 06:40:50 -0600 for this transaction: I participated in a GA with remderosier. Made all payments promptly, had no issues whatsoever! Welcome back anytime! Positive feedback from rally274 on Mon, 9 Jan 2012 00:54:59 -0600: I participated in a GA with remderosier. Positive feedback from technicolorcage on Fri, 6 Jan 2012 15:39:01 -0600 for this transaction: I sold to remderosier. Very patient and friendly and paid promptly. Welcome in my sales any time! Positive feedback from shiningmew on Thu, 5 Jan 2012 19:00:11 -0600: I sold to remderosier. Positive feedback from mandysaurus_rex on Thu, 5 Jan 2012 17:45:44 -0600: I bought from remderosier.